Hello Aspirants, looking for SSC Entry 22nd Tech Women 2018 Indian army recruitment we have a good news for you as Indian army soon will be announcing Applications for Candidates can apply for 22nd Short Service Commission (Technical). 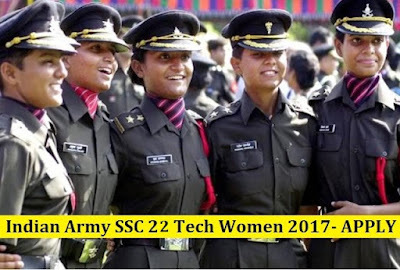 22nd Short Service Commission (Tech) Women Course (OCT 2018) (INCLUDING WIDOWS OF DEFENCE PERSONNEL FOR NON-TECH ENTRY) (commencing at Officers Training Academy (OTA), Chennai for commission in the Indian Army in all Arms/Services. Interested and Eligible candidates can apply online by reading article from the official website of Indian army on or before 17th FEB 2018. Feel free to ask below in comments regarding SSC Tech Women Entry. Educational Qualification: Candidates should have passed Engineering Degree or appeared in the final year examination of Engineering course. The candidates appearing in the final year examination of Degree Course should be able to produce the Engineering Degree within 12 weeks from the date of commencement of training at OTA. Such candidates will be inducted for on Additional Bond Basis for recovery of the cost of training at OTA as notified from time to time as well as stipend and pay & allowances paid, in case they fail to produce the requisite Degree Certificate. Selected candidates will be detailed for training at Officers Training Academy, Chennai according to their position in the final order of merit up to the number of vacancies available in each subject. Candidates neither be allowed to marry during the period of training nor he be allowed to live with parents/Guardians. A candidate who marries during training shall be discharged and will be liable to refund all expenditure incurred on him by the government. A candidate, who marries subsequent to the date of his application, though successful, will not be selected for training. 2. Only shortlisted eligible candidates depending on the cutoff percentage will be interviewed at Selection Centres, Allahabad (UP), Kapurthala (Punjab), Bhopal (MP) and Bangalore (Karnataka) by Psychologist, Group Testing Officer and Interviewing Officer. Call Up letter for SSB interview will be issued by respective Selection Centres through candidate’s registered e-mail id and through SMS. Candidates will not be interviewed locally. Allotment of Selection Centre is at the discretion of DG Rtg, IHQ MoD (Army) and no request for changes are entertained in this regard. Interviews will be held in 2017 for both the entries together.